official posiitons or opinions of either above institution." Swing was born in the USA, in the late 1920s, following the Ragtime (WWI) and Charleston (mid-20s) eras. The music came out of the south (New Orleans), and the dance (Lindy Hop) debuted and developed in the north (Harlem). 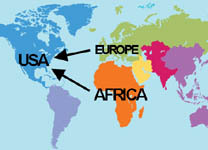 American swing music and dance represent a union of two very different continental temperaments: Europe and Africa. From EUROPE: the big band instruments (trumpets, trombones, saxophones, clarinets, drums), composition, orchestration, and scoring (writing down parts) techniques. From AFRICA: the musical style, including the swing grooves, rhythmic sense (and the rhythms), feel, and improvisational sense. The Charleston dance comes from Africa. Louis Armstrong born in a New Orleans ghetto, and defined jazz solo style for all time. African-American band leader Don Redman, with a college degree in music, created the big band jazz format. He got the idea when he was still in high school at age 14. He put the vitality of raw New Orleans jazz into an organized brass orchestra package. Now, only one person at a time played an improvised solo, supported by orchestrated, written down group structure. Redman also divided the band into sections, which played off against each other. Not only swing music, but also Swing Dance was created by African-Americans. They applied their traditions of expression and improvisation to the European partner dance tradition. In Africa, people did not dance as couples, nor did they touch each other while dancing. European partner style, although highly developed and complex, was stiff - you didn't move hips, shoulders, or chest! The marraige of the two traditions gave birth to partnered jazz dancing. African-American Harlem Savoy Ballroom-based dance troupe Whitey's Lindy Hoppers (named by their manager, ex-boxer African-American Herbert White) defined high-energy performance style to the present day. Frank Manning (1914-2009), key member of that group, continued to dance and teach internationally, well into his 90s. A living icon of the swing era, he inspired millions of dancers, including yours truly. At first, the ballroom instructors considered jitterbug wild, unteachable, and against everything they had been trying to accomplish in the ballroom. They preferred FOXTROT for dancing to the universally popular swing music of the time. However, after several years of alternately denigrating and ignoring lindy hop, Arthur Murray told his instructors to go into the clubs in their respective cities, find out what people were doing, and start teaching that. Eventually a standard ballroom version of swing was created: what is now commonly called East Coast Swing, a codified simplification of the vast possiblities of Lindy Hop. In Europe, the U.K. teachers created Jive, their ballroom version of Lindy Hop. During the 1930s-40s, swing was popular throughout the USA. 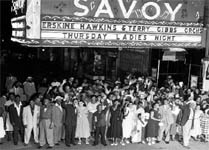 In Harlem NY's Savoy Ballroom, black and white couples were dancing together. Outside of Harlem, dance halls often used a rope to separate the races, but at least they were in the same room! The US government promoted swing as the symbol of multicultural America, a land where cultural unions produced something strong and good. Nazi theorists held an opposite view, outlawing swing, regarding cultural unions as weakening mongrelizations. This view led them to see the American military, "mixed race, mixed culture," as no threat to them. Although one error of judgement among many in the Nazi leadership, this one was the cause of their downfall. In the late 40s, harder rhythms began to appear, starting with the piano-driven boogie-woogie craze, Then came rhythm and blues ( R&B) with electric guitar and bass, Las Vegas lounge swing, Rock & Roll, Disco, and more. New swing dance styles emerged from the '30s onward to suit the musical styles: West Coast Swing (state dance of California), Carolina Shag (North Carolina's state dance), Balboa (Bal-Swing) from Southern California, the St. Louis Imperial, Washington DC Hand Dancing. in the late 1990s Brian Setzer's cover of Jump Jive & Wail (by Louis Prima) and the TV GAP commericial heralded the swing revival. Jump bands Big Bad Voodoo Daddy (You & Me & The Bottle) and C.P. Daddies ( Zoot Suit Riot) provided Billboard chart hit anthems of the Neo-Swing era. A jump style of swing emerged from Sourthern California at the same time, orginally called Retro-swing. Ithaca put its own stamp on it, bringing in Charleston and Lindy jazz moves, hence Ithaca Jumpswing, and it is likely that more styles of swing will come in the future.